Fiber Cement Siding Being Installed On a Home. Would You Like Fiber Cement Siding On Your Union County Home? Fiber Cement siding has rapidly become one of the most sought after siding materials on the market for many reasons. Fiber Cement siding often goes by other names too. For instance, hardie board, cement board, hardie plank siding, cement board siding and cement siding just to name a few of the other names consumers might know this siding material by. Fiber Cement Siding is just like it sounds, it’s a cement fiber board that looks incredibly close to wood, even closely matching the texture and the grain. There are many different colors and textures of fiber cement siding available to Union County homeowners. Fiber Cement siding is one of the more popular alternatives to wood and vinyl siding, although it is a little more expensive. Unlike wood, however, Fiber Cement siding is immune to the most common problems that threaten wood siding, including water damage, rot and termites. Fiber Cement siding boards are specially designed to retain paint better and much longer than wood too without chipping or peeling. Cement Fiber siding comes in a variety of colors and styles that can fit any homeowners tastes and it can even be painted to match your home or for a specific color scheme. It is designed to last a lifetime, resisting cracking, rotting, hail damage, termites and many other possible problems. If you have any questions, or wish to request an estimate, do not hesitate to give us a call today. Why Fiber Cement Siding For Your Union County Home? 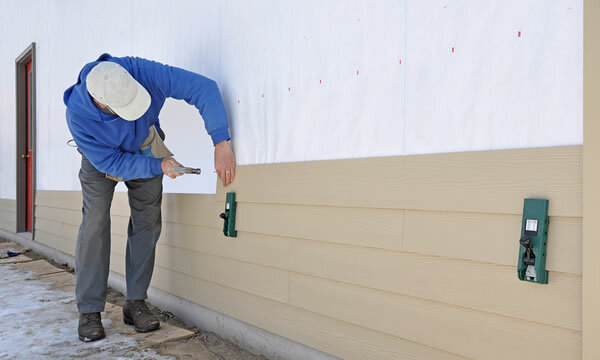 Our extensive experience in all aspects of the siding industry allows us to answer any questions you may have about the pros and cons of Fiber Cement siding, as well as the other house siding options we can offer or siding repair. Angi Home Improvement LLC are the Fiber Cement siding experts in Union County. We understand that you have plenty of choices when it comes to choosing the right Fiber Cement Siding contractor in Union County, New Jersey. When you choose Angi Home Improvement LLC to complete a fiber cement siding project on your home, you’re taking on a new partner with an invested interest in the quality of your finished project. It’s the best advertising that we have!